This Demonstration estimates the combined effect of different risks, starting from a reference risk such as that corresponding to a person's age, gender, and so on. The combined effect of additional risks or potential health benefits can be either additive or multiplicative. In the additive case, the effects of these risks are cumulative and the benefits, if any, are expressed as probabilities, whereas in the multiplicative case, the effects are represented by factors where those greater than one account for increasing the overall risk and those less than one for reducing it. 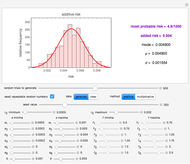 The most probable overall risk is calculated by the expanded Fermi solution based on Monte Carlo simulations, which produce an approximately normal distribution in the additive case and lognormal in the multiplicative case. 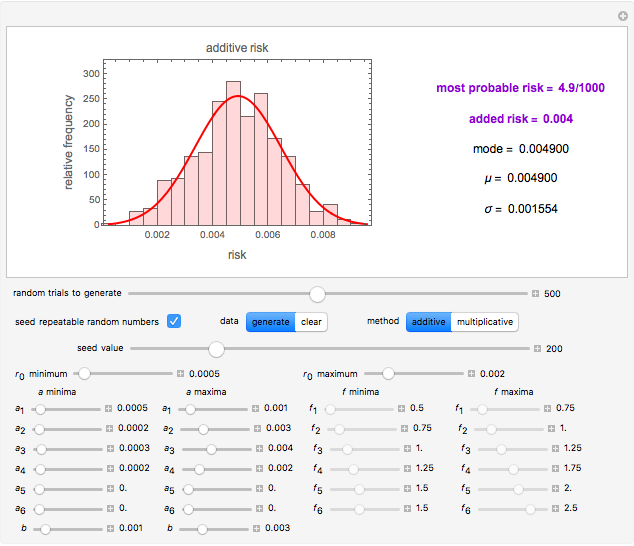 The mode of the generated distribution is considered the best estimate of the overall risk. 1. By adding to individual risk terms through and, if desired, by subtracting a benefit term from it. Each term is specified by a lower and upper limit, entered with sliders. In Monte Carlo simulations, the number of trials is entered with a slider, random values of the terms are picked within their respective ranges, the values are added, and their histogram is plotted. According to the central limit theorem, the sums of equal-length sets of random numbers should have approximately normal distribution. Thus, the normal distribution corresponding to the histogram is calculated by the method of moments and plotted. Its mean (mode) is considered the best estimate of the additive risk. 2. By multiplying by individual risk factors through , in which case the values generated by the Monte Carlo simulation are expected to have approximately lognormal distribution. 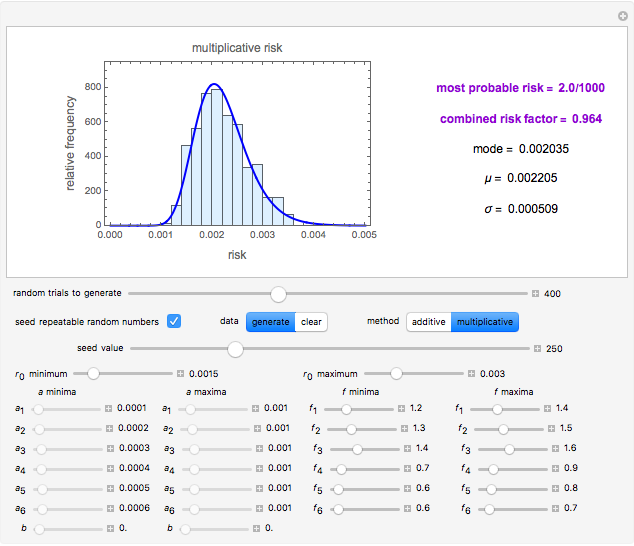 The mode of this distribution is considered the best estimate of the multiplicative risk. A risk-increasing factor will have a value greater than one and a risk-reducing factor less than one. The output display of both calculation methods includes the numerical values of the most probable risk estimate, the added and or combined contribution, and the resulting distribution's mode, mean, , and standard deviation, . A change in any of the parameter's controls generates a new random dataset. Thus, to produce a new random dataset with exactly the same parameter settings, first click the "clear" button and then the "generate" button. If the "seed repeatable random numbers" box is checked, the dataset produced will always be exactly the same for the chosen "seed value". To eliminate an additive risk term, or , set both its lower and upper limits to zero. To eliminate a multiplicative factor, , set both its lower and upper limits to one. Notice that when minimum equals maximum, all the 's minimum and maximum values are the same and also minimum equals maximum this will be equivalent to the original Fermi solution, that is the total risk = . In this case, the histogram will consist of a single bin and the mode, mean and standard deviation will appear in red. Similarly, if minimum equals maximum and all the 's minimum and maximum values are the same this will also be equivalent to the original Fermi solution, that is the total risk = . In this case too, the histogram will consist of a single bin and the mode, mean and standard deviation will appear in red. Not all simulations that can be generated represent realistic risk scenarios. In the additive case, where the settings produce a distribution that is clearly not Gaussian, as, for example, when the values of exceed the sum of the , the usual output is replaced by a warning message in red text. When this happens, the user should click the "generate" or "clear" button, or change the parameter settings to generate a new dataset. 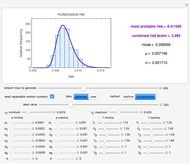 Although discussed in health-risk terms, this Demonstration can also be used to estimate the effect of additive and multiplicative risks in other fields. Mark D. Normand and Micha Peleg "Additive and Multiplicative Risks"